Pioneer is one of the kings of car stereo, but the company has been looking for new ways to enhance how you and your car interact—and how your car interacts with your gadgets and specifically your smartphone. That's why Pioneer's App Radio 2 will have compatibility for both iPhones and Android smartphones. Last year Pioneer brought you the original App Radio, which used the iPhone 4/4s' 3G plan to connect you to everything from Pandora to Rdio, to satellite radio, to maps and weather—all through apps running on your car's infotainment system. Ever since, Pioneer has been constantly expanding the number of apps available for the infotainment system. There are currently 12 apps available for App Radio. 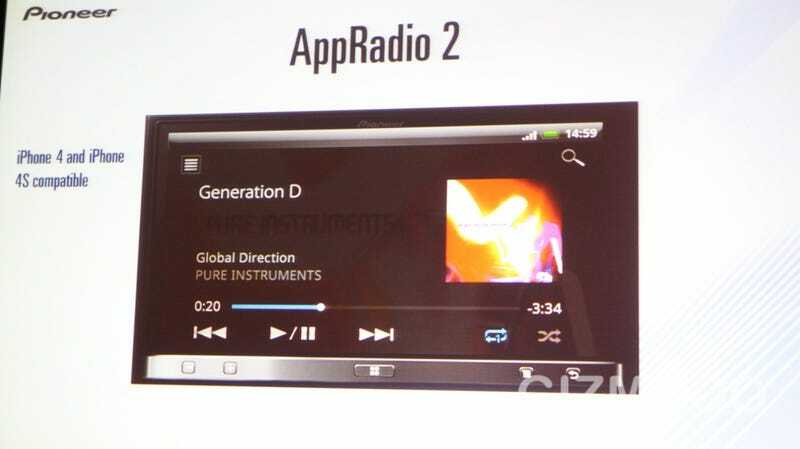 App Radio 2 will bring the same infotainment system integration your Android phone as well. Pioneer isn't saying which apps will have Android , but the company says that it is up to developers to come to it with the applications.. The basic App Radio 2 will be available for $499, but there will be a total of five App Radio 2 models available. If you want to get a really tricked-out system you can pay up to $1200 for it. You'll still be able to buy the original iOS-only App Radio for $399.